Commissioned by the Rotterdam industrialist I.M. 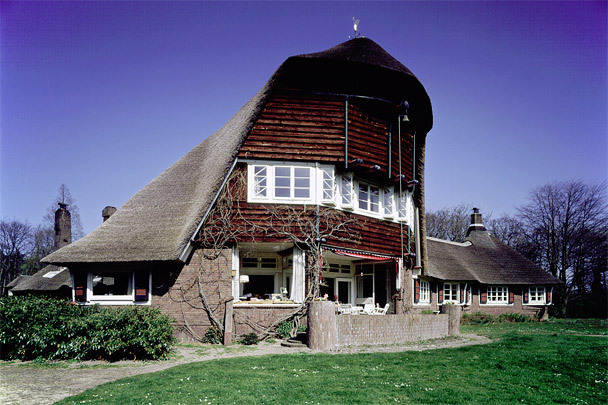 Hudig, this country house is one of the few built examples of the Amsterdam School's 'organic' strain. Designed using moulded clay models, the house is entirely free-form in both plan and elevation. It consists of a central pavilion of sitting and dining room with an upper level, and two less-tall wings, one containing the kitchen and garage, the other bedrooms and nurseries. Vorkink and Wormser also designed a belvedere (since destroyed) and the gardener's house.